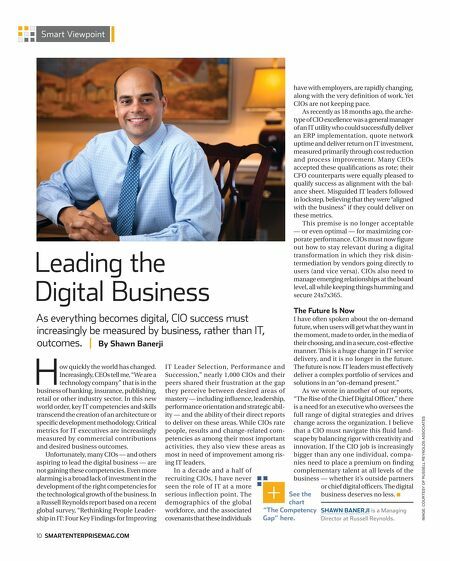 Smart Viewpoint As everything becomes digital, CIO success must increasingly be measured by business, rather than IT, outcomes. | By Shawn Banerji H ow quickly the world has changed. Increasingly, CEOs tell me, "We are a technology company" that is in the business of banking, insurance, publishing, retail or other industry sector. In this new world order, key IT competencies and skills transcend the creation of an architecture or specific development methodology. Critical metrics for IT executives are increasingly measured by commercial contributions and desired business outcomes. Unfortunately, many CIOs — and others aspiring to lead the digital business — are not gaining these competencies. Even more alarming is a broad lack of investment in the development of the right competencies for the technological growth of the business. In a Russell Reynolds report based on a recent global survey, "Rethinking People Leadership in IT: Four Key Findings for Improving 10 smartenterprisemag.com The Future Is Now I have often spoken about the on-demand future, when users will get what they want in the moment, made to order, in the media of their choosing, and in a secure, cost-effective manner. This is a huge change in IT service delivery, and it is no longer in the future. IT Leader Selection, Performance and The future is now. IT leaders must effectively Succession," nearly 1,000 CIOs and their deliver a complex portfolio of services and peers shared their frustration at the gap solutions in an "on-demand present." they perceive between desired areas of As we wrote in another of our reports, mastery — including influence, leadership, "The Rise of the Chief Digital Officer," there performance orientation and strategic abil- is a need for an executive who oversees the ity — and the ability of their direct reports full range of digital strategies and drives to deliver on these areas. While CIOs rate change across the organization. I believe people, results and change-related com- that a CIO must navigate this fluid landpetencies as among their most important scape by balancing rigor with creativity and activities, they also view these areas as innovation. If the CIO job is increasingly most in need of improvement among ris- bigger than any one individual, compaing IT leaders. nies need to place a premium on finding In a decade and a half of complementary talent at all levels of the recruiting CIOs, I have never business — whether it's outside partners seen the role of IT at a more or chief digital officers. The digital See the business deserves no less. n serious inflection point. The chart demographics of the global "The Competency Shawn Banerji is a Managing workforce, and the associated Gap" here. covenants that these individuals Director at Russell Reynolds. IMAGE: COURTESY OF Russell Reynolds Associates Leading the Digital Business have with employers, are rapidly changing, along with the very definition of work. Yet CIOs are not keeping pace. As recently as 18 months ago, the archetype of CIO excellence was a general manager of an IT utility who could successfully deliver an ERP implementation, quote network uptime and deliver return on IT investment, measured primarily through cost reduction and process improvement. Many CEOs accepted these qualifications as rote; their CFO counterparts were equally pleased to qualify success as alignment with the balance sheet. Misguided IT leaders followed in lockstep, believing that they were "aligned with the business" if they could deliver on these metrics. This premise is no longer acceptable — or even optimal — for maximizing corporate performance. CIOs must now figure out how to stay relevant during a digital transformation in which they risk disintermediation by vendors going directly to users (and vice versa). CIOs also need to manage emerging relationships at the board level, all while keeping things humming and secure 24x7x365.